The TWISTER Seal is a two part polycarbonate plastic and wire that offers an alternative to lead/plastic and wire seals but has the advantage of being applied without the use of a sealing tool. The seal is applied by threading the supplied wire through the two holes in the Twister housing and turning the handle clockwise. The wire is twisted around the insert until the desired length is achieved. The handle is then broken off securing the wire in position and creating an extremely secure and tamper-evident seal. The transparent housing allows for easy visual inspection and confirmation of seal integrity. The Twister seal is supplied with a 0.67mm diameter, 12' long, nylon coated wire - 24" optional. 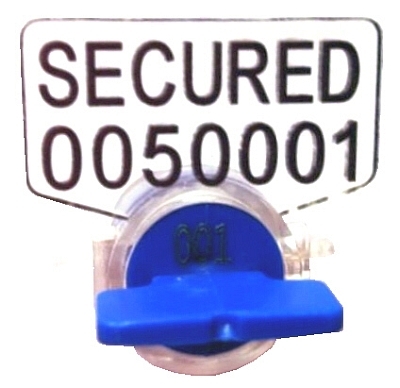 Seals are marked with the word SECURED and have unique serial number sequences. 1000 pcs $132, order 10 units! Pricing is per 100 pieces. Please click Customize before adding to cart.